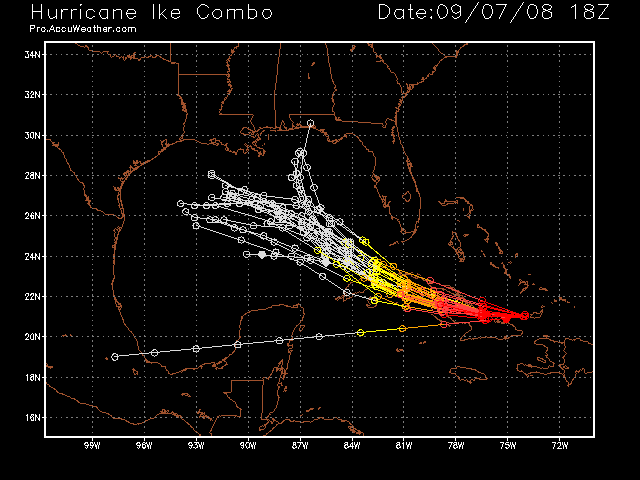 Hurricane Ike was near 21.1 north and 74.6 west, 75 miles north-northeast of Guantanamo, Cuba. Maximum-sustained winds have dropped to 120 mph with higher gusts, making Ike a powerful Category 3 hurricane. The central pressure as reported by the Hurricane Hunter aircraft is 945 mb, or 27.91 inches. 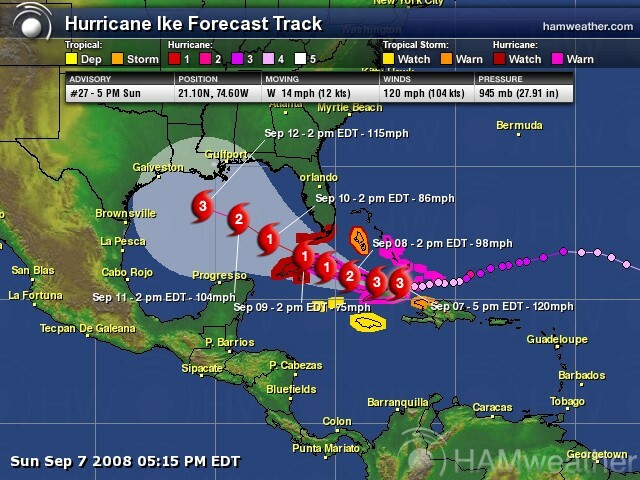 The hurricane is moving west at 14 mph. Hurricane-force winds extend outward up to 60 miles and tropical storm-force winds extend outward up to 145 miles. 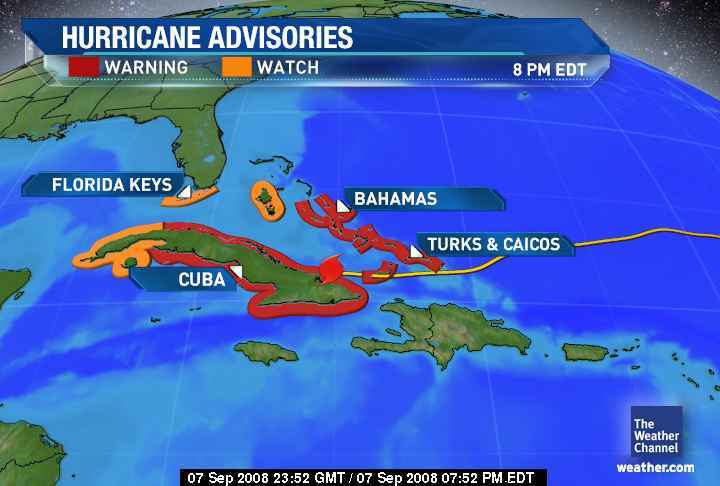 Hurricane warnings are in effect for central and eastern Cuba, the central and southeastern Bahamas and the Turks and Caicos islands. 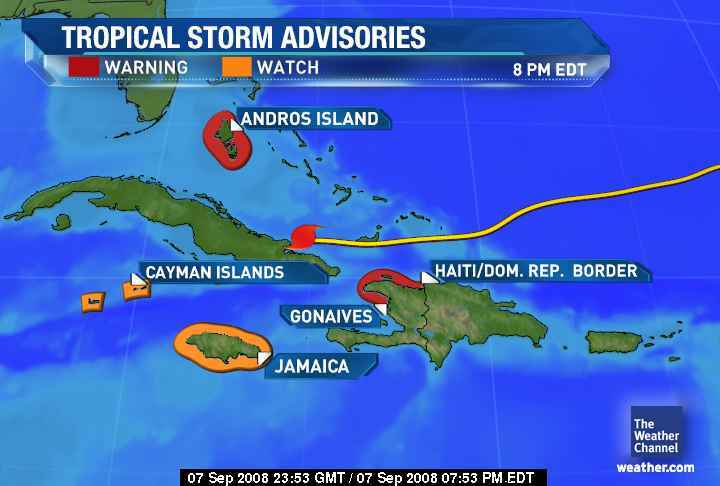 Tropical storm warnings are in effect for Andros Island in the Bahamas and the northern peninsula of Haiti. Hurricane watches remain posted for western Cuba, the Isle of Youth and the Florida Keys south of Ocean Reef, including the Dry Tortugas. Tropical storm watches are in effect for Jamaica and the Cayman Islands. 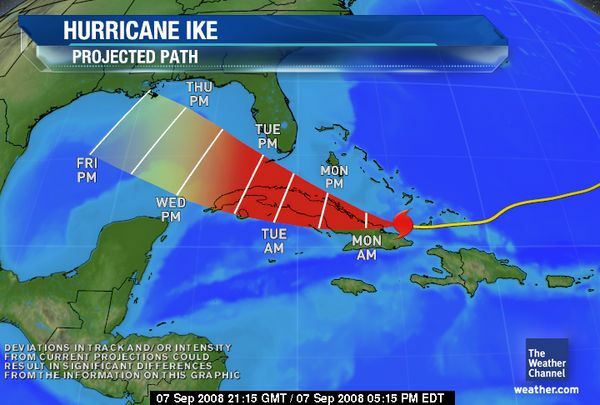 Hurricane Ike weakened slightly to Category 3 strength after it moved over Great Inagua Island in the southeastern Bahamas Sunday afternoon. Ike is still a Category 3 hurricane with 120 mph, but the latest reconnaissance data from the hurricane hunters and the latest satellite loop show that Ike may be strengthening as it approaches the coast of Cuba. The westward track will continue Sunday night, and the hurricane will make landfall over eastern Cuba Sunday evening. Ike will bring extensive and perhaps extreme damage upon landfall and a storm surge flooding of 13-18 feet above normal tide levels. Rainfall amounts of 4-8 inches with higher amounts of 12 inches are possible as well. The storm will slowly take a west-northwest shift and move across central Cuba during the day Monday. The intensity and speed of the storm will fluctuate over the next 24-48 hours due to the interaction with the Cuban landmass, and Ike could weaken to a Category 1 during this time. The storm will re-emerge over the Gulf of Mexico by the middle of next week, impacting the Florida Keys Monday afternoon into Tuesday. Some re-intensification over the Gulf of Mexico is possible as the storm moves over warmer waters. 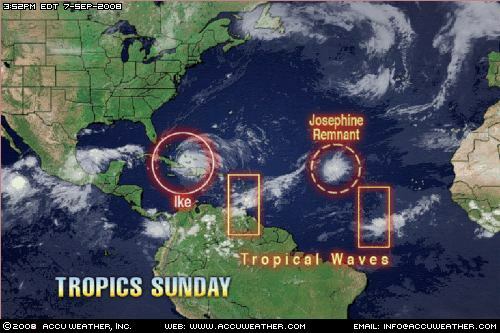 In the meantime, all interests in the Bahamas, Florida and along the Gulf Coast states should keep up with the latest information on Ike. Dangerous rip currents and rough surf will effect the southeastern United States coast through the next several days. 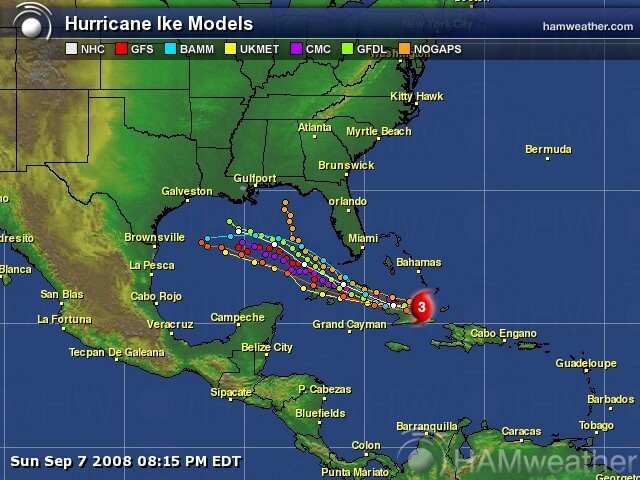 This entry was posted in Hurricane Season, My2bucks Eye On The Tropics, News, weather and tagged Hurricane Ike, Hurricane Ike computer models, Hurricane Ike Spaghetti Models, spagh, Tropical Storm Ike, Tropical Storm Ike computer models, Tropical Storm Ike Spaghetti Models. Bookmark the permalink.